Here is the code to decipher the coordinates for the Golden Egg! The final coordinates should take you somewhere at the Fairgrounds. Text (775) 427-6679 if you would like to verify coordinates. The coordinates are different if you are using Google Earth or Google Maps. You need the letters from the first 10 eggs to locate the Golden Egg. All the eggs will be available the whole weekend, so get out and hunt! LOCATIONS ARE UP ON GEOCACHING.COM! Visit the website to create a free account and start logging your visits throughout the Hunt! Coordinates to each egg are listed below as well - use Google Earth or the application of your choice to look up the locations! No Eggs are Located By Venturacci Park - check the updated coordinates on #4. The GC links below for each egg will take you to the Geocaching.com listing for that egg! 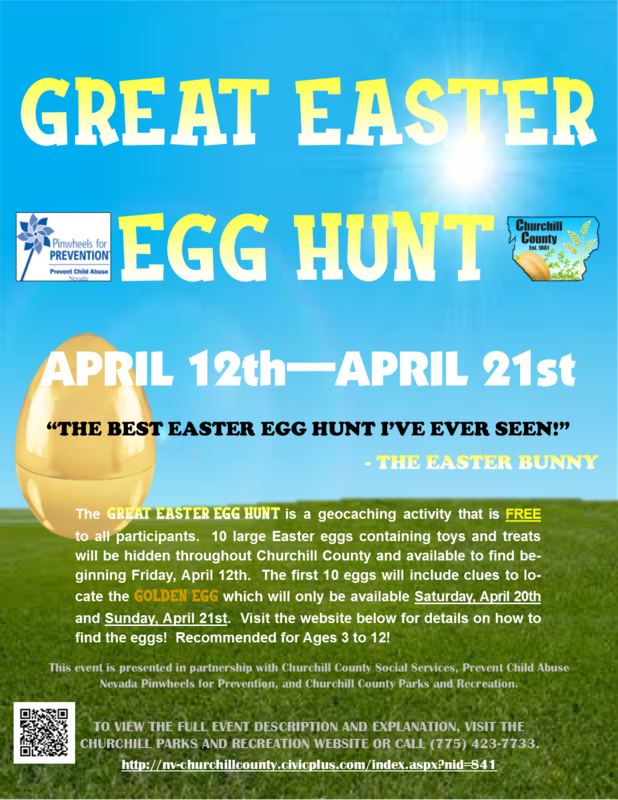 The Great Easter Egg Hunt is a geocaching activity that is FREE to all participants. 10 large Easter eggs containing toys and treats will be hidden throughout Churchill County and available to find beginning Friday, April 12th. The first 10 eggs will include clues to locate the Golden Egg which will only be available Saturday, April 20th and Sunday, April 21st. Visit the links below to learn more about how geocaching works and how you can participate! The eggs are posted as 'traditional caches' on geocaching.com. You may download the app or register online for a free account. An annual subscription is available through geocaching.com, but is not required to view the Great Easter Egg Hunt caches. View this video for a how to guide on geocaching! The individual GPS coordinates for the caches are posted above. You may use the GPS application of your choice to locate the caches and then travel to the site to find them. We recommend Google Earth or Google Maps. Each of the initial 10 Eggs have a Letter of the Alphabet. Collect each of these letters! You will use them along with a final clue (to be released on Saturday, April 20th) to locate the Golden Egg. The Golden Egg will only be available on 4/20 and 4/21 and everyone who locates it will receive raffle tickets for the Child Prevention Month raffle to be held at the Community Fun Day on April 27th!